This stag do bundle is great for any groom to be looking for something that’s a bit different, with two exciting activities that will definitely create a stag do to remember! With this in mind, we want to offer you a zorb football and dodgeball stag do bundle for just £54. Below is a little more information about what these two popular stag do ideas are about, helping you decide if these activities could create the perfect stag do for you. Rising in popularity recently, a zorb football stag do is a great option for something exciting, active and unique that all of your mates can get involved in. If you’re a lover of everything football then this activity is for you, with a classic football element and a hilarious twist that will have the whole stag group bouncing, bumping and laughing the whole time. All of our instructors are keen to get you stuck in, bringing forfeit sheets and prizes for you to get a little more competitive in the mini games like zorb bulldog and a funny forward roll race. The whole session lasts about 1 hour giving everyone time to master the zorbs, have some free for all fun and then get on with the races and competitions. A couple of 5 a side games with a completely unique twist and as many mates as you want, what more could you want for a memorable stag do! All of our venues are in the city centre of your chosen location, making it ideal for a stag do as they are within walking distance of bars and clubs, if you want finish your full day of activities with a night out. Plus everything is organised for you, so all you need to worry about is having a great time on the day. A classic for any stag who loves a great time that’s a little more active, dodgeball has been a popular choice for years as it’s the perfect way to have a laugh with your friends while enjoying a fully organised event. This stag do activity is completely stress free, with all the equipment provided and an instructor to create some competition, making for a great pairing in the zorb football and dodgeball stag do bundle. Some of the games and competitions include medic and last man standing as well as many more that will be tailored to your stag group’s interests on the day, and some forfeit sheets to get everyone’s competitive side pumping. With a dodgeball stag do you can go all out and add a theme with some hilarious fancy dress to really make the stag do memorable! Like the zorb football, every one of our venue’s is located in the city centre of your choice, making travelling to the activity so much easier, as well as giving you the opportunity to complete your stag do with a meal or a couple of drinks in the many city centre bars. 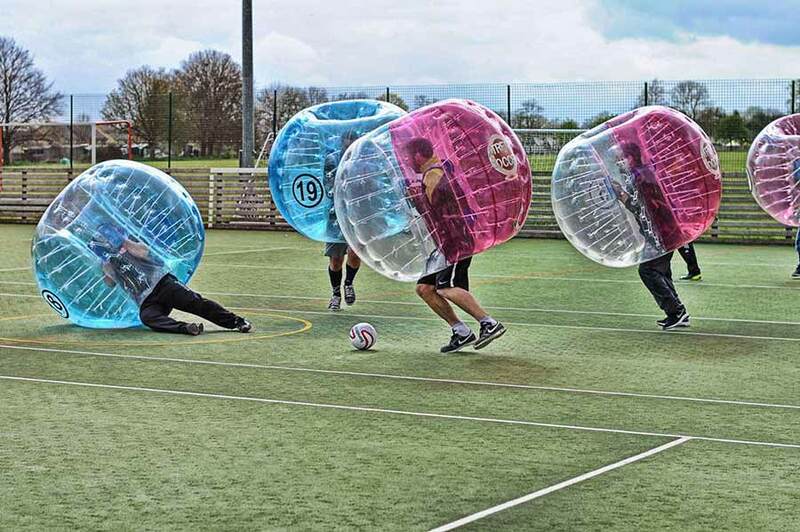 Does this zorb football and dodgeball stag do bundle sound ideal for you? If so let our events planners organise the whole thing for you and call us on 0161 341 0052 for a stress free and exciting stag do!